A fast read filled to the brim with action, heartache, and love. A ship burns, sinking into the dark sea. There is only one survivor—a child hunted for the power of her song. Hidden away on an isolated island, Lilette buries her power deep, convinced it caused the deaths of those she loves. But she can’t run from who she is. And when her secret is revealed, the only thing that can save her is her song. 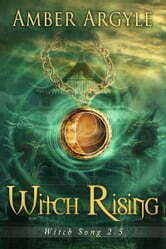 It’s time to rise up and become what she was always meant to be: the most powerful witch ever born. A good book for young readers. Sorry it was too short. This book is very nice... Really I love it.. Awesome book... I can't believe it is great.. 1st time I read this book... Really awesome.. Next time I wanna read this book..
this book started off fast and really never slowed down. the story is great and written well.